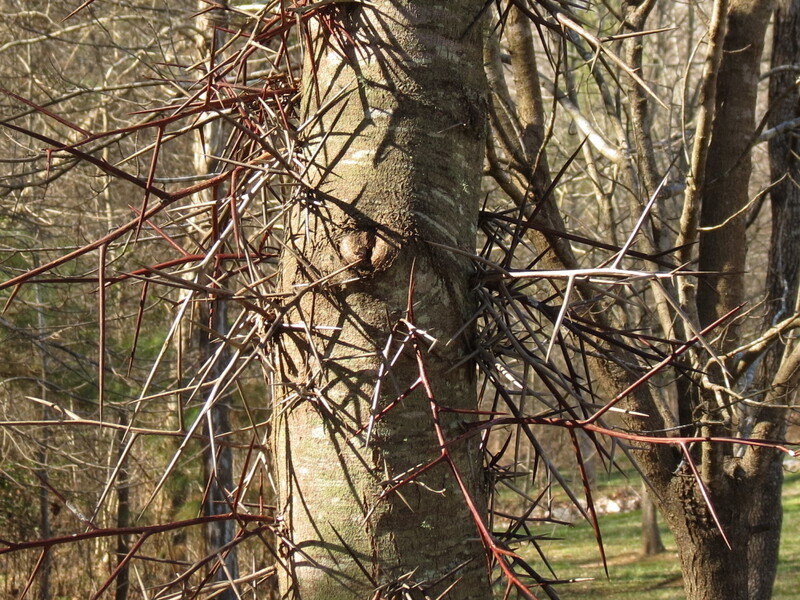 The Honey Locust (Gleditsia triacanthos) is a native tree known for its formidable thorns and its long, twisting pods. The pods contain seeds that are surrounded by a sweet, honey-colored pulp. The thorns and pods are shown below. 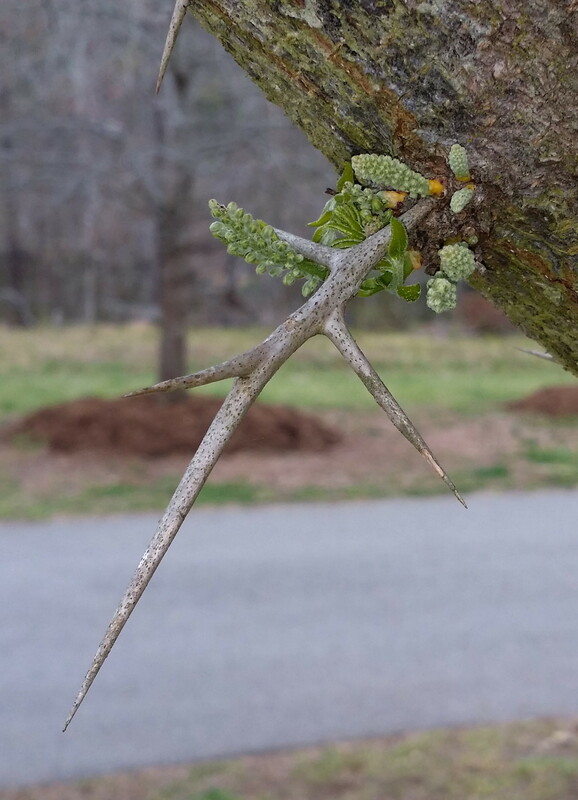 The Honey Locust is definitely not known for its spring flowers, which are somewhat obscure and can be lost in the tangle of thorns and emerging leaves. 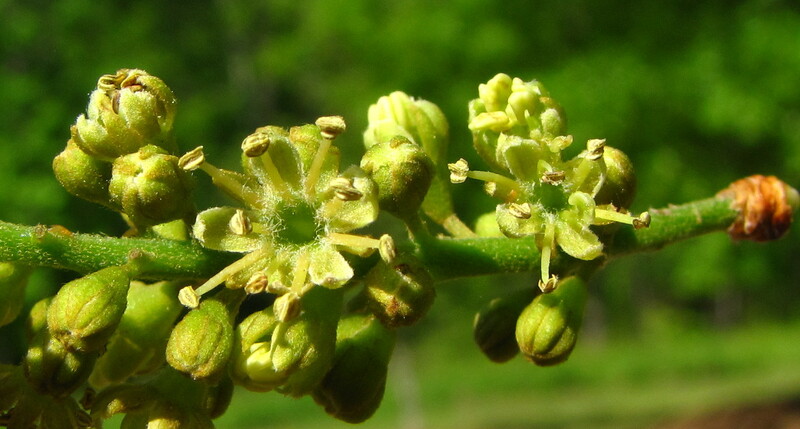 Male and female flowers appear on separate trees, but all trees (that are flowering) also have some flowers that contain both male and female parts. The botanical term for this is polygamo-dioecious. 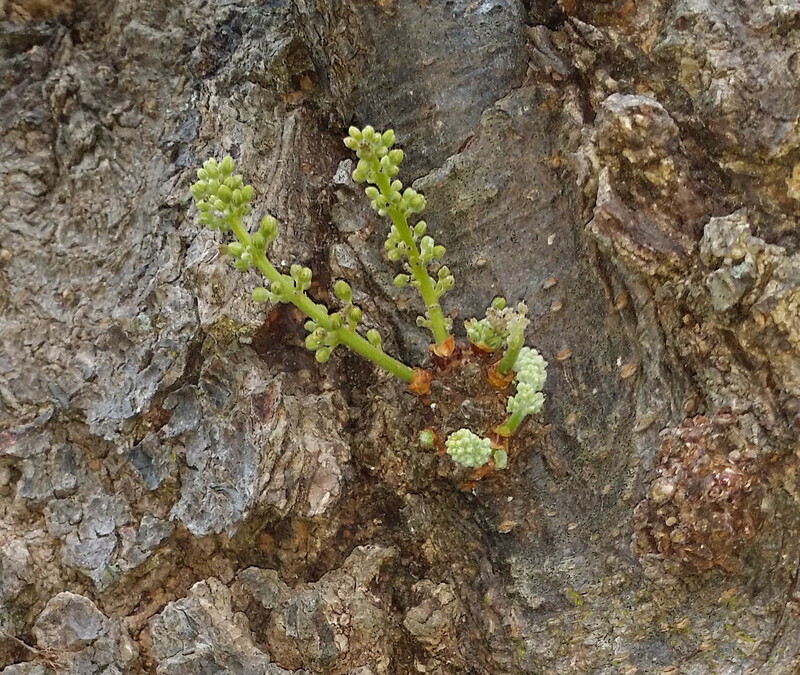 The flowers appear as catkins, and in the photos below, started emerging the first week of April. They arise from the tissue surrounding branch scars and from the tissue at the base of thorns, which are simply modified branches. The catkins did not open until warmer weather the first week of May. 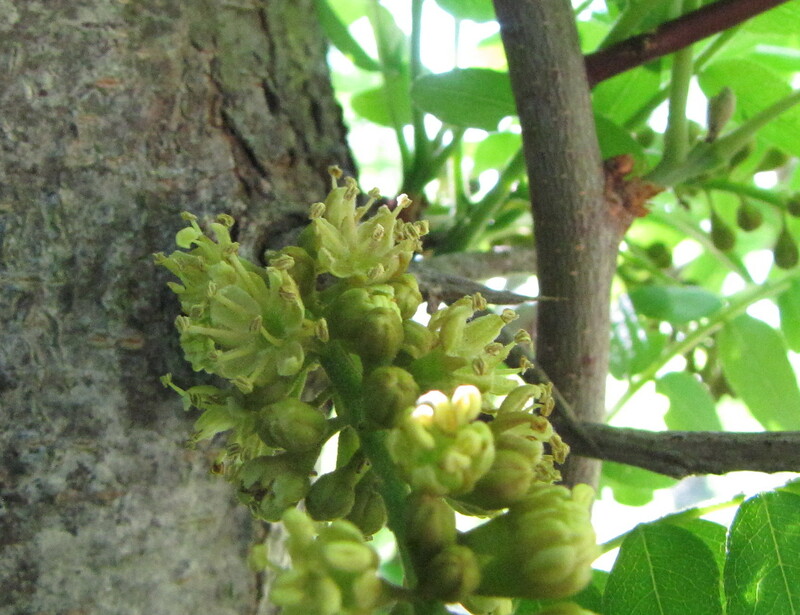 This tree turned out to be a male, and the stamens, with the large anthers at the tip, can be seen in the photos below protruding from the flowers. Honey Locusts are very tough trees, and survive environmental extremes and poor soils. What they do not tolerate is shade or fire. North Carolina is not part of their natural range, which is the central U.S., but they are found in most areas of the state as a minor part of forest ecosystems. 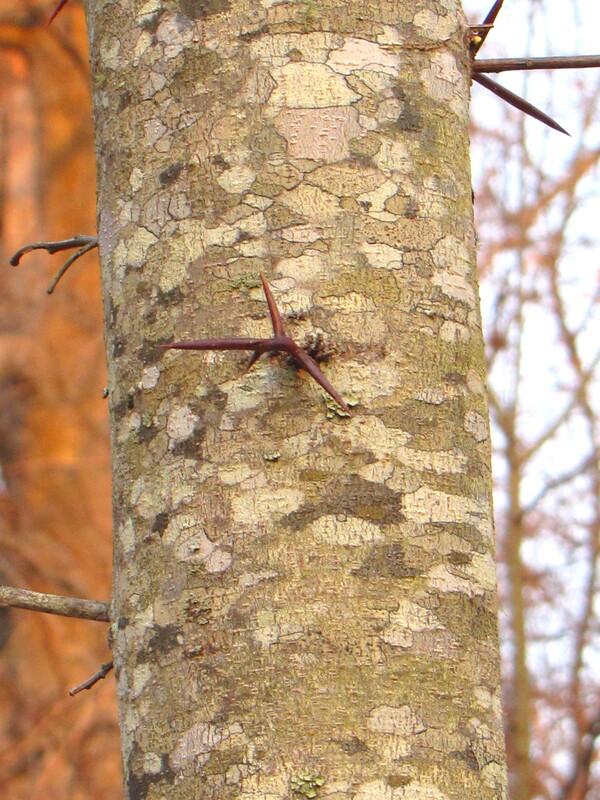 Thornless trees do occur naturally, and have been adapted to cultivation to produce city plantings that tolerate pollution and meager soils without the inherent hazards that the thorns present. 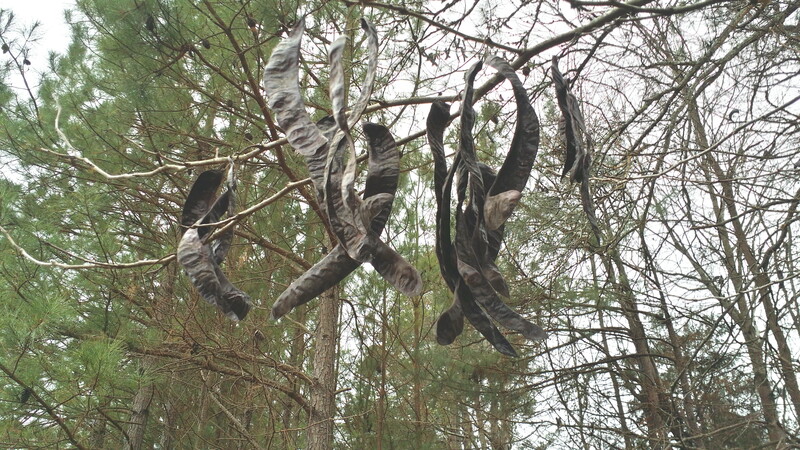 This entry was posted in Uncategorized and tagged catkins, Gleditsia triacanthos, Honey Locust, pods, polygamo-dioecious, thorn. Bookmark the permalink. Herb, I knew nothing about this tree but it’s name. Thank you. Not I am intrigued and will watch for an example when I’m out. I think there may be some at Clemmon State Forest. Thanks Adair. Another surprising aspect of the Honey Locust is the bark, which can have beautiful patterns with softly accented colors. I added another photo at the end to illustrate this.